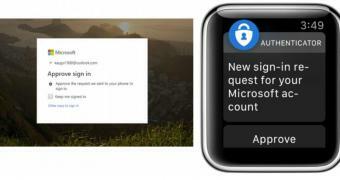 Microsoft has recently announced the public preview of its Authenticator app for the Apple Watch, technically allowing any owner of Apple’s smartwatch to try out the seamless authentication process to Microsoft accounts without the need for passwords. Microsoft Authenticator is already available on Android and iOS, and it has received a bunch of major updates lately, especially as Microsoft itself has become more committed to these mobile platforms. With today’s announcement, the Authenticator app goes live for the Apple Watch too, which makes it possible to approve a sign-in attempt to a configured Microsoft account from the comfort of the wrist. This means a phone is no longer required to grant permission to log in, and given the big number of Apple Watch owners, this is very likely to be an update that makes the whole process more convenient for many.